Viora Reaction ReFit, advanced radio frequency. Micro needling is a minimally invasive procedure using fine needles to create new collagen production. We love it because it shuttles specific anti-oxidants and nutrients to lower layers of skin where it is needed. This has been one of the biggest challenges in the non-invasive cosmetic industry. We also offer an added growth factor serum from AQ. Growth factors are proteins that promote the growth, organization and maintenance of cells and tissues found in healthy, young skin plus antioxidant vitamins that stimulate collagen production. There is less down time than with lasers and IPL. A post-treatment kit is specially designed to care for skin after a micro needling session. A series of microneedling can effectively reduce acne scars, tighten pores, and is excellent for smoothing fine lines like smokers’ lines along the lip. Best of all, the longer term results are an overall improvement to the skins’ appearance, because it stimulates the body’s collagen production, which dimishes with age. The plant-based human growth factor nutrients and anti-oxidants can work more effectively as they reach deeper under the upper layers of skin. I just wanted to send along a before and after picture, after one session of needling. It’s still a bit red but I already notice a difference. Yay! See you soon for a second treatment. Difficult to treat, this condition is the result of genetics, ethnicity, aging and environmental stressors. 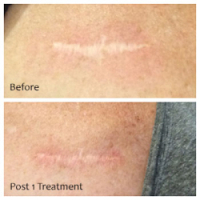 We use micro-needling to safely target this area, where laser can not be used. Micro-needling shuttles nutrients and anti-oxident products into the skin, while promoting natural collagen production. Our physician-grade product lines from Obagi, Image, Skinceuticals, Nevona support skin health and help you look your best at every age. Remove unwanted blemishes and fine lines, treat sun and age spots, melasma and rosacea with IPL, Fractional Resurfacing and Spectra.